The Energy & Environmental Research Center Foundation® held its annual board meeting at the EERC on October 12. Board members met to discuss a number of potential, new, and ongoing technology transfer and commercialization activities. After the meeting concluded, the board met informally with EERC researchers and staff who lead the world in developing solutions to energy and environmental challenges and make the EERC an outstanding place to work. Front (left to right): Alice Brekke, Ron Ness, Bob Harris (President), Tom Erickson, and DeAnna Carlson Zink. Back (left to right): Mark Johnsrud, Chris Greenberg (Vice President), David Straley, and Jeff Hume. Not pictured: John Snustad (Secretary/Treasurer) and Robert Kelley. 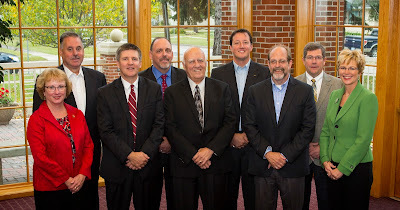 The EERC Foundation was formed in 1992 as a separate, nonprofit corporation existing solely to support the commercialization activities of the EERC, while maintaining an operating agreement with the University of North Dakota. The rights to intellectual property developed by the EERC are transferred to the EERC Foundation, which then often licenses the rights to developed technologies and fosters relationships with strategic industrial partners willing to invest in commercializing those technologies. “The EERC Foundation helps to provide a vehicle for transition of the technology from the EERC to the marketplace,” said Tom Erickson, CEO of the EERC.